Koh Rong Sanloem is a beautiful island off the coast of Cambodia with white sand beaches, swaying palm trees, and jewel-like turquoise waters. Many see the island as a welcome alternative to its neighbor, the larger and very popular island Koh Rong, which has earned its international reputation as a chaotic party spot. To say Koh Rong Sanloem is more laid back than Koh Rong is an understatement to be sure. Moreover, the smaller island can offer a range of travelers a variety of experiences, since different parts of the island each have their own unique vibe. 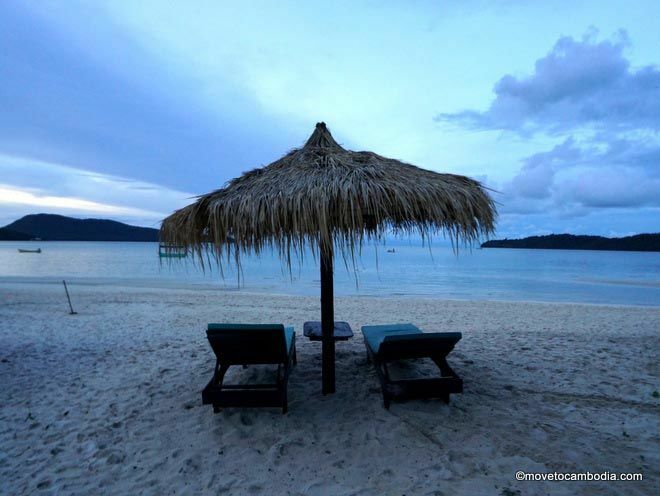 Koh Rong Sanloem offers a relaxing alternative to Koh Rong. One bay offers relaxation and luxurious lodging, while another has a setup that is great for families. One area of the island will appeal to hang-loose travelers looking to stay for a while, and there’s a fishing village that has become a backpacker paradise, but with the easygoing vibe that seems to be quickly disappearing on Koh Rong as that island gets more and more popular. Koh Rong Sanloem has something for everyone — there’s even a boisterous full-moon party once a month — so all you have to do is decide where on the island to go. We’ve got all the information on specific beaches you need to help you pick which one is right for you. The island has 37 kilometers (23 miles) of coastline, most of it beach. On the western side of the island are several yellow beaches. On the eastern side is Saracen Bay, the most popular tourist destination on the island, with white sand beaches and shallow turquoise water that’s perfect for splashing around in. The interior of the island is dense tropical jungle, with trekking paths and the opportunity to observe the local flora and fauna. Natural beauty abounds on the island. 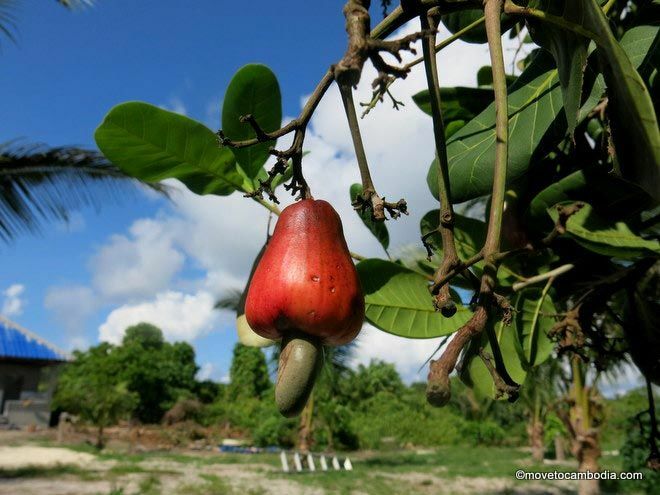 Here, a cashew fruit. 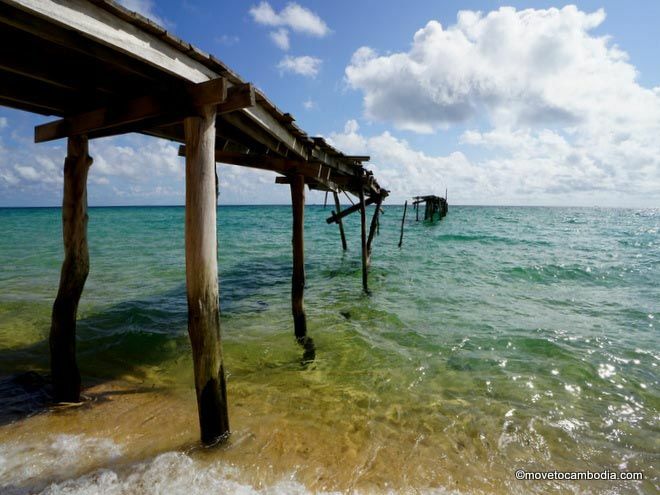 Koh Rong Sanloem has more recorded history than most of Cambodia’s islands. In 1857 the British Royal Navy’s HMS Saracen conducted a survey of the Cambodian coast and islands, leading to production of the first map of the area three years later. Heart-shaped Saracen Bay got its name from that British brig. During the period of the French Protectorate, between 1863 and 1953 the French took only a middling interest in the island, building rudimentary roads to connect its various parts. These days, however, the roads are a distant and long-overgrown memory, and travel around the island is done by boat. One of the last vestiges of the French on Koh Rong Sanloem is a lighthouse atop a mountain on the southern tip of the island. It’s worth a visit, offering stunning views of Koh Rong Sanloem’s various beaches and bays. Crystal clear waters on Sunset Beach. In 1975 Koh Rong Sanloem was dragged into the last official combat action of the Vietnam war when the Khmer Rouge seized an American container ship, the SS Mayaguez, and its crew off the coast of Koh Poula Wai, the most distant of Cambodia’s islands. The kidnapped crew were first taken to Koh Tang and then, unbeknownst to the American navy, brought to Koh Rong Sanloem, then home to a small Khmer Rouge military base. They were kept there for three days in a bamboo warehouse before being put on a fishing boat and sent out to sea, where they were rescued by the U.S.S. Wilson. Although there were many casualties during the American assault on nearby Koh Tang, there were none on Koh Rong Sanloem, where the crew had been treated to typical Khmer hospitality and reportedly fed rice, chicken soup, and pickled eggplant by friendly locals. An interesting bit of trivia about Koh Rong Sanloem is that for years it was called Koh Rong Samloem in travel guides due to a mis-transliteration. The word ‘sanloem’ refers to a place that is far away, while ‘samloem’ isn’t actually a word in Khmer. The island is still called the wrong name in many guides and maps, and there are many English spellings of the name in current use. M’phey Bei is Koh Rong Sanloem’s major fishing village (and backpacker hangout). The island has never been very heavily populated, with just one busy village, M’phey Bei, and two small fishing hamlets that are home to just a handful of residents. It’s controlled by the Cambodian navy, which has a base there, but they’ve rented out large portions of the island to foreigners and Cambodians alike, who have set up all manner of beach resorts, with more being added every day. Luckily the lot sizes are much larger than on Koh Rong, allowing the bungalows to be spaced further apart and giving the beaches a much less crowded feel. Of course as the island becomes even more popular, that’s almost certain to change. For now, though, Koh Rong Sanloem is a relaxed island paradise with the charm of an undeveloped island but with more amenities than you’ll get on the other Cambodian islands. Looking for more? 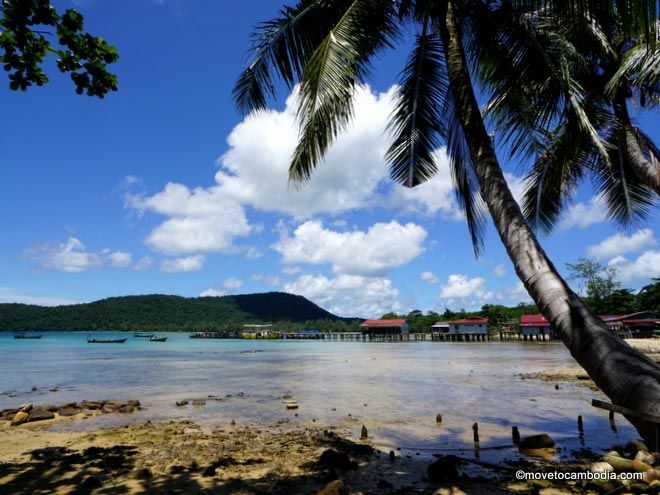 View the full Koh Rong Sanloem island guide for info on how to get there, tips on where to stay, and what to do.